If you are a movie lover, you can not miss the Oscar nominated movies!! 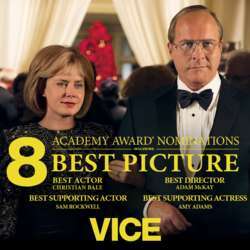 We are going to start this season with VICE nominated for 8 awards from the academy. After seeing this great movie nominated we will share a nice time somewhere near where we can have a beer or have a delicious dinner .... "After movie" will be defined once we have the theater. we will so happy to see you there! Don't miss it! Information about place (movie theather, dinner/drink place) , contact phone number and price will be posted once we know in which spot we will see the movie.